Are you going on a roadtrip this summer? We are! 10+ hours in the car with a 5 year old and an almost 2 year old = this Mommy needs to get creative! A close friend of mine was a Montessori teacher, so I knew she would have some great ideas for little projects my 5 year old could tackle. 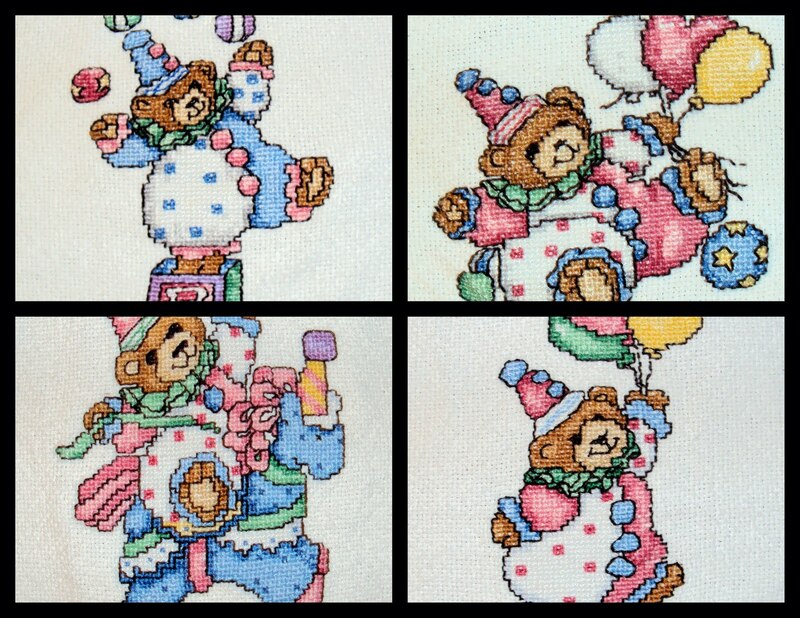 As soon as she mentioned cross-stitch my wheels started turning! I loved cross-stitching when I was younger and am so excited to introduce it to Elle! The kit includes a piece of gingham fabric stretched on a little embroidery hoop, some embroidery floss on plastic cards stored on a metal ring, a needle on a scrap of felt, a needle threader & thread cutter, and a matchbox I covered with some fun sparkly scrapbook paper to keep the little bits in (I was hoping the matchbox is cute enough to inspire her to keep track of the needle so it doesn't end up floating around my car... wish us luck!). 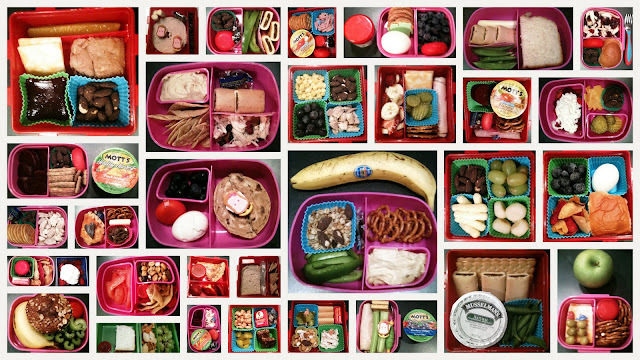 I haven’t posted pictures of the bentos I’ve been making for Elle in quite a while, so I have a bunch for you! Liv will be starting at the Montessori school Elle goes to next year and I’m feeling a little nervous about making 2 bentos every morning. I admit that sometimes I dream about how much quicker it would be to pay for a school lunch or easier to just send a sandwich and chips every day. But seeing all the bentos I’ve done the last couple months in one spot like this is at least a little reassuring… somehow I manage to pull them together even on our busiest mornings & most importantly I feel really good about the variety of foods she eats and that we’re teaching her about making healthy choices! In this round of bentos we have – corn, blueberries, chocolate roasted almonds, rotisserie chicken, banana, hard boiled eggs, veggie chips, prunes, ritz crackers, baby bell cheese, Hawaiian rolls, cinnamon raisin bagel, dried cranberries, ham, dried cherries, fig newtons, trail mix, quiche, corn bread, edemame, string cheese, fruit leather, pink grapefruit, beets, apple sauce, pickles, granola bar, dry cereal, raisins, triscuts, pretzels, celery, lunch meat, jello, grapes, water chestnuts, natural cheetos, almond butter and jam sandwich, cheddar cheese, strawberries and whipped cream, hummus, and green bell peppers. It's been entirely too long since I featured my favorites from my weekly Your Way Wednesday posts, so buckle up, I've got three for you. 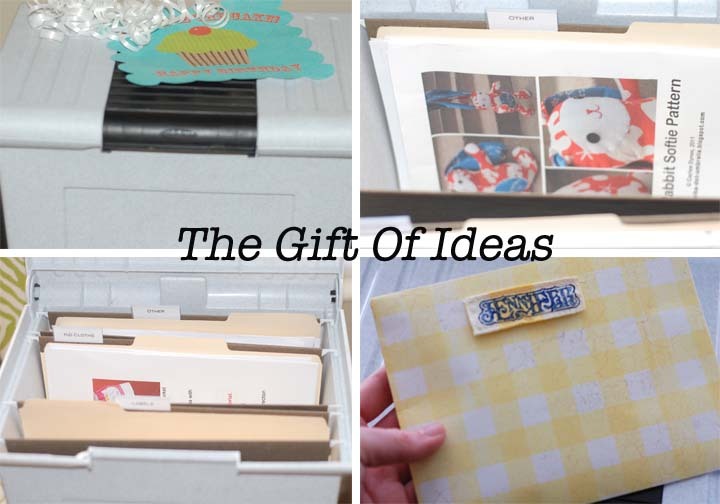 Starting with a little something I would love to be gifted... a file box of ideas! The Polka-Dot Umbrella submitted this post and I've been thinking about it since. I love reading my favorite blogs, and I'm pretty good about filing the things I want to reference again later, but when it's time to make that project I've been meaning to tackle I'm probably gonna print off the tutorial... or when my 5 year old is begging for a "project" searching through my blog files and printing them just takes too long. This is a great solution... inspiration at your finger tips! Next up is this camera strap Originate and Renovated submitted. I love everything about this strap! The colors, the giant rick rack, the flowers, the big buttons, it's all so pretty! I don't have a fancy camera or even pretend to understand how one works, but I would be beyond impressed if my photographer showed up with this beauty around her neck! And from last week's links is this pretty ring One Artsy Mama made. 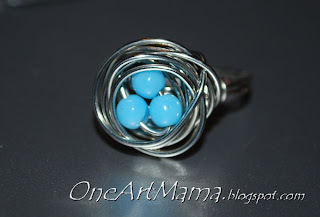 I love silver jewelry and the robins egg blue beads in the nest ring are perfect! The party I've been neglecting you... errr planning... for the last few months was last weekend. I'm super excited to show it to you all! My lovely photographer has lots of work to do to get all the pictures ready, so you'll have to wait just a bit longer, but I thought I'd at least show you the invite and give you a little teaser of what's to come. As I mentioned earlier, we've been picking produce at a local hydroponic farm nearly every weekend for the last few months. Elle always has a great time and thought her friends would like to pick too, so we hosted an end-of-school-year party at the farm. I found these invitations in Rethink Ink's Etsy shop early in the planning process. I love the natural look of them, the seed catalog liners for the envelopes, and the hand drawn feel! They were the inspiration for the design of the rest of the party. I was super busy with projects for this party! There were 4 party favors, 2 activities, a food table, a sit down breakfast for the kids, a photo taking spot, and party decor so I'll have lots of how to posts for you as soon as the photos are ready, stay tuned! Father's Day is less than a month away, but there's still plenty of time to make this adorable gift set for the men in your life... matching Daddy and son ties. I made these for a friend and his new son. I picked up a couple ties at Marshalls (I always find great ties there! ), cut one up to use the fabric in the applique on the baby's onesie, and wrapped the onesie and the other tie up together as a gift set. So from what you can see in this before and after can you guess what my next party theme is? The party is this weekend and how crazy I get over party planning (exhibit A - my last party) is all the excuse I need for not getting this Your Way Wednesday up until less than an hour before it's no longer Wednesday. So sorry about that, I'll try to make it up to you with leaving it open for a few days and promising awesome party pics to come! This is the first year we've had a little one in school... between family friends and school friends we have had a birthday party to attend nearly every weekend. I put a lot of effort into finding gifts that I can feel good about giving. My criteria is that they inspire creativity, are handmade, or support local artists... oh and of course I hope the birthday kiddo actually likes them! I NEVER give gift cards, they're just too impersonal... I want the receiver to know that we thought of them specifically when we picked out their gift and money just doesn't say that. I made an exception this weekend though because I can see how, especially for a kid, it would be fun to pick out their own prize and I also appreciate the "value of a dollar" lesson that can be learned from using a gift card. It's always a challenge but I'm pretty excited about what I came up with for the two birthday parties Elle has this weekend! I bought giftcards, but so as not to feel bad about how impersonal they are, I also purchased a couple too cute for words... just admit it!... pocket monsters that my friend, Kelli of Red Marionette makes. The pocket monsters are adorable but half the fun of buying a Red Marionette creatures is reading its "story". Kelli has an uncanny way of bringing her creations to life! So in addition to the pocket monster & the gift card, I made a little illustration of the monsters... a likeness if you will... to include on a card with thier stories. So here's the best part, Red Marionette is not only having a sale on pocket monsters right at this very moment, but you can also get FREE shipping by using the coupon code FREESHIPPINGMAY when you check out. And as if my adorable idea and Kelli's irresistable creatures weren't enough reason to leave this blog page right now and get started on a gift for the next birthday girl or boy on your list (did I mention this is THE PERFECT GIFT for either gender?! )you had better hurry because the pocket monsters are an endangered species. The ones listed in the Red Marionette shop right now are the last of their kind (i.e. Kelli is discontinuing them). 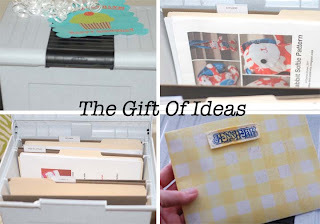 Do you have any creative ideas for kids birthday gifts? I'd love to hear them, leave me a comment! Elle goes to a small Montessori school (I should post about Montessori one of these days… we’re completely in love!). They don’t have a cafeteria, so all the kiddos and I’m assuming teachers, bring their lunches… or bentos in our case… to school. So I thought pretty lunch bags would be a useful little gift to give Elle’s teachers for teacher appreciation week! I was originally thinking I would make the lunch bags from oilcloth, but I didn’t have enough time to drive up to the fabric shop that I knew would have a good selection. Even if I had made the drive I would’ve had to make them all from the same 2 prints or have lots of scraps since you only need a little fabric for this project. Laminated cotton was the perfect solution! It took 3 and a half yards of this particular laminating material (I bought glossy, not matte), I had a 50% off coupon, and I got to use up some of my favorite scraps! Confession: I finished the bags Wed. night and was planning to design cute tags and take some nice photos of the bags all lined up Thurs night in time for Elle to give them to her teachers on Friday. Thurs. morning I woke up and realized my plan wouldn’t work because Elle is off of school on Friday! So tags and photos were done while packing Elle’s lunch, feeding the girls breakfast, and getting myself ready for work. Cut one strip of fabric for the main part of the bag 29 ½ inches by 8 inches. Cut two strips for the sides of the bag 12 ¼ inches by 5 inches. Laminate the 3 pieces of the bag by following the instructions that came with your laminating material Tip: I used paperclips when needed… pins will leave holes in the lamination. Fold the main fabric in half and make ¼ inch long slits in both sides of the fabric strip 2 ½ inches from the fold. So when unfolded your main strip of fabric will have four ¼ inch slits 5 inches apart from each other on both sides of the center of the strip. Sew-in the side panels - With right sides (i.e. laminated sides) together sew one long side of a side panel to the main bag with a quarter inch seem allowance. Stop a quarter inch from the slit you cut. Turn the bag and line up the short side of the side panel between the two slits and continue to sew stopping a quarter inch from the slit. Turn the bag again and sew from the slit back up to the top of the main fabric. Repeat on the other side. Turn the bag right sides out & finger press the seems. Fold the sides of the bag in and cut along the top of the bag with pinking shears. Sew a length of hook and loop tape to the main part of the bag, centered 3 inches from the top. Sew the other side of the tape to the other side of the main part of the bag, centered ½ inch from the top. Roll down the top of the bag, fasten is with the hook and loop and clothespin a little tag to it. First things first, my favorite from last week's Your Way Wednesday is this great tote that Ms Not So Perfect made that would be Oh so perfect for Mother's Day! 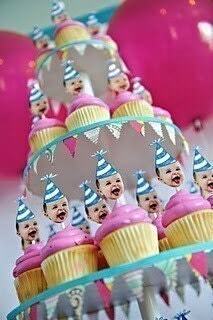 Just wanted to quickly share that the One in a Flash party I did for Liv was featured on the fabulous Baby Lifestyles! Be back soon to show you the teacher appreciation gifts I'm doing for Elle's teachers.